Sound familiar? If so, you’re not alone. Whether you’re working within an agency or in-house at a brand, it’s all too common to hear people writing off content strategy as a time-consuming nice-to-have. If you’re the one planning for the creation and production of quality content, you can’t accept that mindset. To make good content decisions for the business, you have to think strategically. And to think strategically about content, you need tools. As you may have noticed, content strategy tools are plentiful these days. 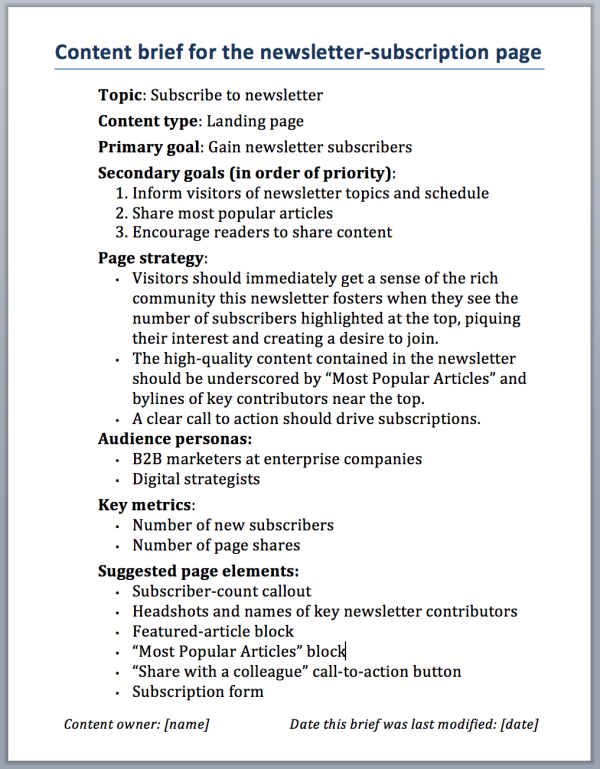 For example, Meghan Casey has written about many of them in her book, The Content Strategy Toolkit. When you’re new to content strategy, it’s hard to figure out which tools to use first. I’ve arrived at this short list based on my years as an agency-side content strategist working with brand managers and marketers at B2B and B2C companies. When used at the right time, each tool is invaluable in fostering a strategic, efficient, and scalable content framework. Start by developing a message architecture, which is your North Star for any content marketing road map. A message architecture prioritizes a set of goals to communicate about the brand across channels, laying the groundwork to ensure that everyone is telling the same story. By aligning business goals with user needs, the message architecture enables action toward a shared vision, from blog posts to PPC campaigns. The message architecture is one step beyond voice and tone guidelines and provides a holistic look at what the overall user experience should accomplish. Although “message” often implies words and copy, the message architecture is more than just what you say or how you say it — it’s who the brand is at the core. Approaches for establishing a message architecture vary from business-centric Venn diagrams to adaptations of information architecture exercises. My favorite method relies on a card sort of 75 to 125 adjectives (ranging from obvious ringers to apparent contradictions) as described by Margot Bloomstein in her book, Content Strategy at Work. Gather brand stakeholders in a room — from sales and operations to UX and customer support — to discuss, define, group, and prioritize characteristics through the lens of who we are, who we are not, and who we would like to be. You can use this-but-not-that distinctions for this. The resulting three groupings of words can be synthesized into a message architecture that will serve as a guideline for tactical and strategic content decisions. It may be ideal to develop a message architecture when you’ve just set out to overhaul a site or develop a marketing strategy from the ground up. However, it’s a useful tool to have at any stage to guide future work. Everyone — from marketing and sales to product design and engineering — benefits from the priorities and goals conveyed in a well-thought-out message architecture. After you develop a message architecture to succinctly prioritize the way your brand should be represented, it’s time to inventory and audit your content. A content inventory captures a high-level, quantitative overview of what content exists and where it lives. It’s not a transcript of copy; the content inventory is a snapshot of key topics, formats, audiences, and locations for existing content. It’s never a bad time to assess the quality, scope, and depth of the content you’re producing. In fact, a content inventory is something you should be sure to update constantly over time (biannually keeps things in check, though quarterly may be a smart option for more prolific teams). Various tools, such as Paula Land’s Content Analysis Tool, can help automate the process of taking inventory, generally resulting in a spreadsheet. Tools can’t automatically gather everything you need to know, though. I’ve found that many nuances and key metrics need to be added manually, so I have always hacked the spreadsheet, adding columns and recording observations as needed. When developing my inventory spreadsheet, I usually divide content across tabs labeled brand, editorial, and product (if applicable). Under the brand tab, I inventory content in detail. For larger sites, it isn’t always necessary to inventory every page; grabbing a sample, representative page is usually fine. Overall, this type of detailed inventory — particularly when done manually — offers insight into what is important to the brand and its customers. 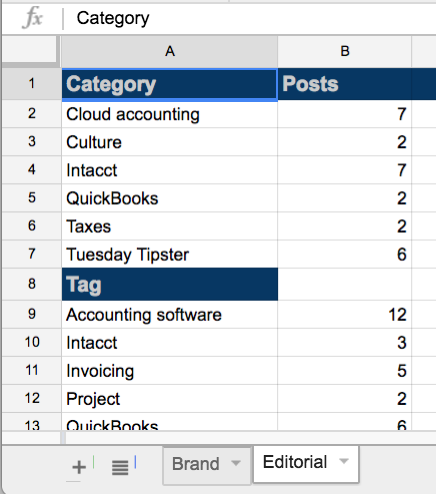 Under the editorial tab, I inventory blog content (often in much less detail) to take stock of topics, tags, and categories. A content inventory is also an eye-opening exercise that helps you recognize holes and opportunities. If possible, draw some metrics to understand which areas are resonating with your audience. Looking at page-level insights in Google Analytics, such as average time on page or bounce rate, can be especially indicative of areas falling short — or getting the most attention. You’ll probably want to add a notes column to the inventory document where you can record these suggestions as part of your audit. This level of detail may not always be appreciated by a broader team — you probably won’t want to share this spreadsheet with executives, for example — but it’s a useful repository for improvements or lessons that you want to keep in mind. Pull the most actionable recommendations into a slide presentation — think lightweight and shareable — to communicate the content audit findings with your team. A quick and simple review can align teams and drive efforts around your biggest opportunities. When you have completed your inventory and audit and have identified your biggest opportunities, develop a content brief. This is typically one page that helps the team — copywriters, designers, client stakeholders, and anyone else involved — understand what the high-level goals are for each page or section of your site. The content brief ensures alignment about the information to convey, offers suggestions for how to present that information (large copy block or embedded video, for example), provides guidance for content creation, and supports an informed wireframe and design process. A clear, insightful content brief saves designers a lot of time, revisions, and guesswork. A content brief can ensure that design follows content rather than the other way around (as often happens when companies take a less strategic approach). Every web page or distinct section of your site that your team will be working on needs its own content brief. A content brief facilitates conversations about priorities, goals, and depth of information covered on each page (or in each section) of your website, creating a time-saving blueprint for the team. As a marketer thinking strategically about your organization’s content, you’ll find this starter kit — your message architecture, content inventory and audit, and content brief — will serve you well. It should also serve your team well. Of course, I call it a starter kit for a reason. You’ll most likely need more than these three tools. Discovering (and hacking) your own favorite tools is all part of the fun. Strategy work is never done. 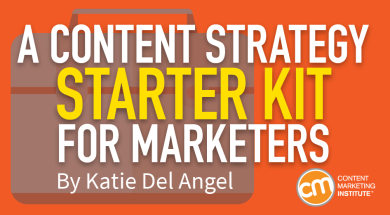 What tools would you put in a content strategy starter kit for marketers? If you are serious about putting content to work in your business, you won’t want to miss the Intelligent Content Conference March 28-30, 2017 in Las Vegas, Nevada. Early-bird rates fly away on December 16, 2016, so register today. Katie Del Angel is the content marketing manager at CloudCheckr, whose web-based application of the same name helps enterprises manage and optimize their AWS deployment. At CloudCheckr, Katie works with an agile marketing team to drive inbound marketing and optimize website content. Previously, Katie established a content and commerce framework for clients at Copious, a digital agency in Portland, Oregon. Before that, she wrangled a cross-departmental team of content contributors at Connective DX to drive inbound marketing efforts. When she's not tinkering with words and spreadsheets, she's spearheading the Content Strategy PDX Meetup group and rallying an underground cheese club. You can connect with her on Twitter @katiedel.